The Rolex Submariner “Milsub” is certainly one of the most popular and coveted models from Rolex because of their rarity (these watches were issued to servicemen and never available for sale) and the aura of adventure and adrenaline that surrounds them. The present watch ticks all the boxes that make collector’s hearts beat faster. Made for the British Royal Navy according to their specifications, the “Milsub” is a modified Submariner reference 5513 featuring wide sword-shaped hands for enhanced readability and an encircled “T” on the dial, indicating the use of luminescent tritium. The MOD (Ministry of Defense) also required a hacking seconds and permanent, fixed spring bars welded to the lugs to prevent the fitting of a reflective bracelet. Another noticeable difference between the military and civilian models are their case back engravings – the present lot marked with the "0552" code for British Ministry of Defense, "923-7697", the NATO code, followed by the issue number. "785" and year of issue, "72". 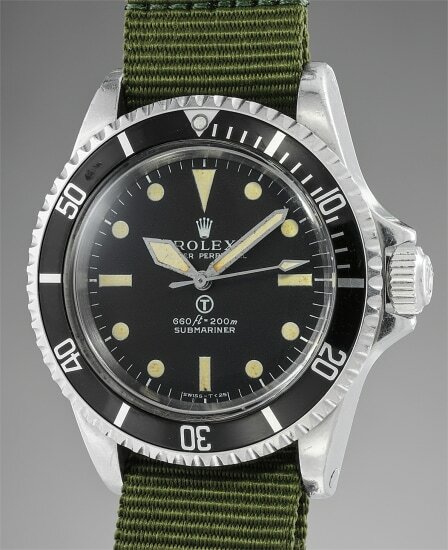 When decommissioned, they were sold by the MOD during the 1980s, and purchased by civilians and dealers who often replaced or removed the military-specific components - the encircled T dial, sword hands, 60’ bezel, engraved case back, and fixed spring bars - to transform them into more commercial, “civilianized” Submariners. Thus, very few MilSubs have survived with their “military-spec” configurations. The present watch was issued in 1972 but was presented to Lieutenant Paul Henke in 1975 when he qualified as a mine warfare and clearance diving officer in the Royal Navy. At the time he was lieutenant and second-in-command of a Royal Navy minehunter. Having trained at Dartmouth Royal Naval College Paul Henke qualified as a bomb and mine disposal expert, specialising in diving and handling explosives. He led a crack team of underwater bomb disposal specialists and also became the Commanding Officer of various minesweeping and minehunting ships. He served in Northern Ireland, where he survived a machine gun attack in 1976. Today, Paul Henke is a full time writer with 15 books published. After leaving the army Paul Henke offered the watch to his son who wore it with an Oyster bracelet with the links folded over the fixed bars. After having treasured it for over 27 years the son has decided to offer it at auction. Considering that Paul Henke wore the watch on his missions the watch is in very good condition. The bezel was swapped after servicing. Both the reference and serial numbers finely engraved between the lugs are clearly legible, the reference number and the last three digits of the serial number are repeated to the inside of the caseback, as the connoisseur would expect. The “Milsub” is one of the rarest Rolex Submariners on the market, finding one fresh to the market, from family of the original owner with such pedigree make this example a must have for the discerning collector. Founded in 1905 England by Hans Wilsdorf and Alfred Davis as Wilsdorf & Davis, it soon became known as the Rolex Watch Company in 1915, moving its headquarters to Geneva in 1919. Like no other company, the success of the wristwatch can be attributed to many of Rolex's innovations that made them one of the most respected and well-known of all luxury brands. These innovations include their famous "Oyster" case — the world's first water resistant and dustproof watch case, invented in 1926 — and their "Perpetual" — the first reliable self-winding movement for wristwatches launched in 1933. They would form the foundation for Rolex's Datejust and Day-Date, respectively introduced in 1945 and 1956, but also importantly for their sports watches, such as the Explorer, Submariner and GMT-Master launched in the mid-1950s. One of its most famous models is the Cosmograph Daytona. Launched in 1963, these chronographs are without any doubt amongst the most iconic and coveted of all collectible wristwatches. Other key collectible models include their most complicated vintage watches, including references 8171 and 6062 with triple calendar and moon phase, "Jean Claude Killy" triple date chronograph models and the Submariner, including early "big-crown" models and military-issued variants.